After outgrowing the capabilities of their former content delivery network (CDN) of 12+ years, Verizon needed to find a better CDN. Their bucket list included better self-enablement and better performance at a better cost, and they had to migrate over 170 applications without disrupting their users. 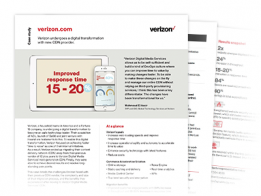 Download the case study to learn more about how our CDN propelled Verizon.com into becoming one of the most agile technology leaders in the world. You can also watch our webinar covering the migration.